There has been some family controversy surrounding my maternal grandfather and great grandfather. There have been legends that sprang up to support 'the story'. Exercising some genealogical muscle, I set out to do what I do. Prove or disprove using facts. The "Q" family records stopped with my great grandfather...and that is always interesting. Now I know that circa 1900, he changed his name (possibly a brush with the law). That part of the family settled in Hatteras Island, North Carolina. They lived on the outer banks since some time in the early 1700's and were alternately pirates, smugglers, fishermen and salvage operators who claimed ships driven ashore and shipwrecked. They owned slaves - not black ones - hapless seafarers who washed up on the Outer Banks. Great grandpa Q left all that for Washington DC, where he lived most of his life, dying in 1971. My mother described him as a mountebank, which may have been what drew him there. He was alternately a brick layer, a boxing promoter and an opportunistic crook. His son, my grandfather was a scammer (not unlike his daddy) and for most of his life, he was a revival tent preacher, known as "Reverend Jack". I only saw Reverend Jack a couple of times that I can recall. He was a handsome Elmer Gantry style guy without the scruples of the movie character. He had two children with my grandmother before she dumped him. I have no idea how many other likely lads are out there. He founded a church in Tennessee eventually and died there. I didn't spend much more time with my mother (an accomplished ballerina from the American Ballet Theater) who, at 84, still walks and moves like a ballerina. The harsh discipline that made her a great dancer also made her very difficult to love. The last thing that my brother asked me before he died (the next day) in auto accident was to be nice to her, so I put myself out to do that very thing. My mother bought the story of the history of the Q family hook, line and sinker. She wasn't all that happy to know that rather than descending from a group of farmers who were kind to the Indians, and my great grandfather married an Indian princess, they were a species of pirate who preyed on the unfortunate. The antebellum South took race very seriously (the records are clear) and the Q family didn't have any known affiliation with the Hatteras Indians, all of whom had been killed off between 1520 when it was first settled and the early 1700's. Mother had other stories from her maternal side as well. I don't think that she made them up. She's not like that. But she took things at face value and created a legend that she has shared with my daughters. Shining a light on family history (the roaches scuttle for the floorboards) is interesting. I have a trip to the outer banks planned, to dig a little deeper. There is a lot of provable information on-line these days including family bibles that have been photographed and made available on the Internet. But walking old cemeteries in Frisco, Buxton and Hatteras might turn something up. There are some dangling bits of history that may have wound around my DNA. 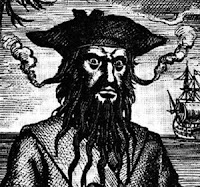 For example, Blackbeard-the-Pirate (Edward Thatch - or Teach) operated in those waters. Did my ancestors sail with him on the Queen Anne's Revenge or the Witch of Endor? They were in the right place at the right time, in the right line of work. Blackbeard accepted a royal pardon and settled in Bath, North Carolina, right across the Pamlico Sound from Hatteras, where the Q family was living at the time. Did they rub shoulders? I can't say for sure (yet). Mother (who is very proper) is disturbed by this history, which is much more fun to me...no wonder I always like the Pirate ride and eating at the Blue Bayou restaurant at Disneyland. Mother is not amused.